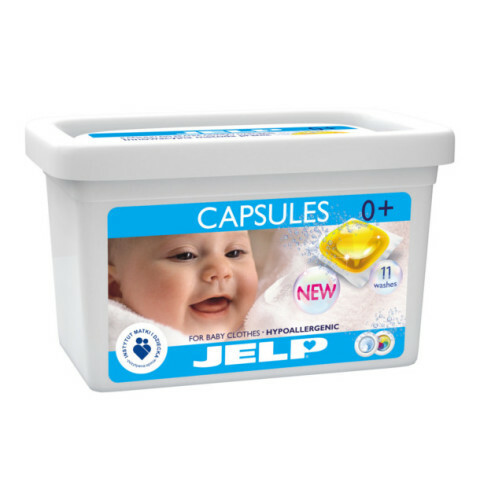 Jelp washing capsules offer an easy and safe way to wash delicate baby clothes. A careful selection of ingredients and hypoallergenic formula based on natural soap guarantee the safety of your baby's sensitive skin. The capsules are approved by the Institute of Mother and Child. They effectively remove dirt from lights and darks. Suitable for washing all fabrics (except for wool and silk). Jelp washing capsules are exceptionally easy in storage and measuring (one capsule = one wash) - you will always be using just the right amount of detergent. The child-proof box is a guarantee of your baby's safety.